Phnom Penh (VNA) – Cambodia and Thailand have agreed to lift two-way trade to 15 billion USD in the shortest time by promoting people-to-people and infrastructure connectivity, and improving the capacity of international border gates between the two countries. 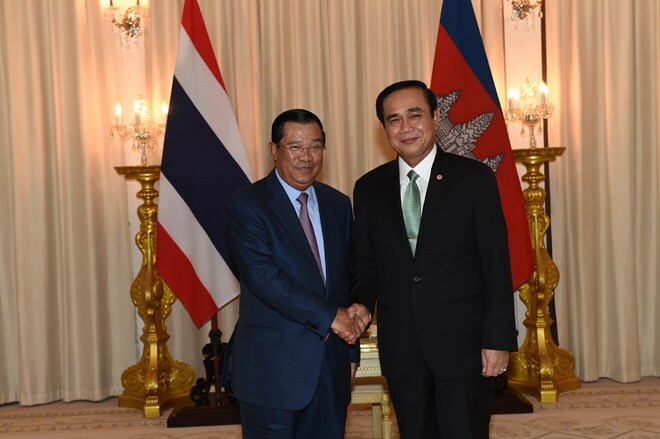 It was agreed by Cambodian Prime Minister Samdech Hun Sen and his Thai counterpart Prayut Chan-ocha in a bilateral meeting on the occasion of Hun Sen’s visit to Bangkok, Thailand to attend the second Asia Cooperation Dialogue, according to the Rasmei Kampuchea news on October 11. The two PMs agreed on the need to further boost trade as well as expand and upgrade border gates. Hun Sen asked Thailand to offer all possible support to Cambodian workers in the country, and also vowed the best conditions to businesses from abroad and Thailand in particular. Last year, two-way trade between the two countries hit 5.23 billion USD, 4.68 billion USD of which was Cambodia’s exports. More than 250,000 Cambodians are currently working in Thailand./.